►Compact and Convenient: This mini Smart Plug saves more space for you , allow you to control two home appliance and night light with only one socket. And more excited thing is both outlets and night light are all work with Alexa, google assistant,IFTTT. That mean you can remote control your smart plug not only by your phone but also your voice. No Hub Required, only needs Wi-Fi. ►Smart Plug With Night Light: A smart plug is not enough, we added a smart Led night light to guide you in the dark. It provides soft and glare-free lighting without dazzling, brightness adjustable, much convenient for bathroom or living room. It’s great for new moms to use when breastfeeding at night, you can even set a timer to comfort your kid to sleep. ►Schedule and Timer: Get ready to have a smart home and Schedule your wifi outlet to automatically power your electronics on or off. Like setting your coffee maker work on morning and turn TV off when it’s time for your children go to bed. You can create a group for all of your smart devices and control them all with just one command. 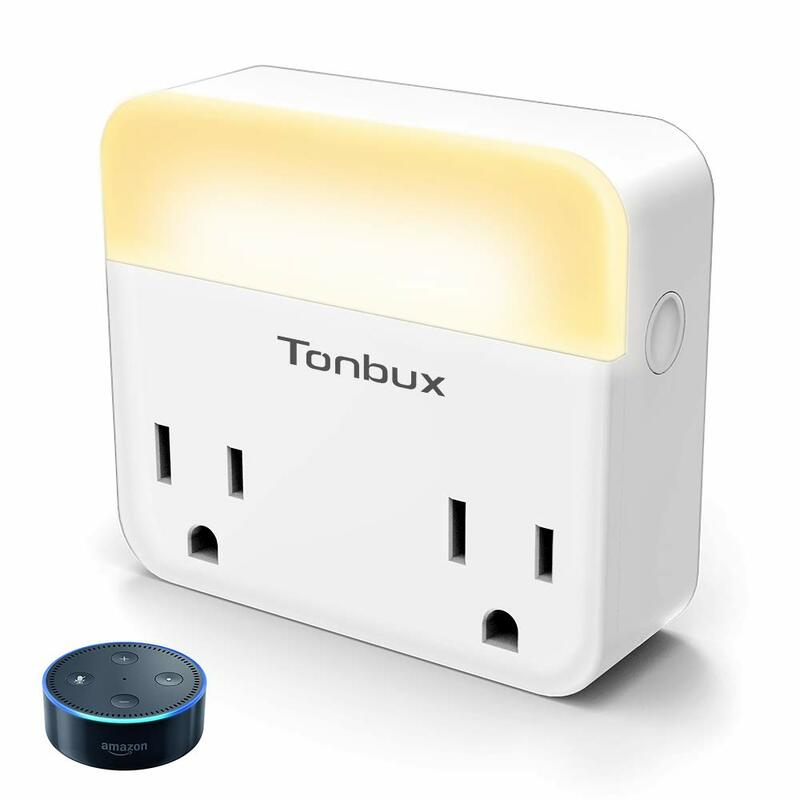 ►Easy to Install: Simply plug the wifi outlet into electrical outlet on your wall panel, and download free “ Smart Life ” APP, connect smart life account to Alexa. Then there you go, you can use this wifi outlet to control all your home appliance by your voice or app. Kindly note this wifi outlet Only supports 2.4GHz Wi-Fi network. ►Quality Guaranteed: Tonbux smart socket is FCC, ETL approved product with US design patent. We guarantee 30 days money back, 2 years warranty and lifetime service support. If you have any questions or suggestions, please kindly contact us.